SUMMARY, PRESS RELEASE and RESPONSES regarding Ove von Spaeth's treatise on dating Senmut's star map, which was published in "Centaurus" 42;3, July-August 2000. The paper in question was later re-edited, for non-astronomers, to be used in the appendix in volume 2 of Ove von Spaeth's book-series on the historical Moses (cf. web-page concerning Vol. 2 and Debate on Vol. 2 ). The astronomical knowledge of the ancient Egyptians turns out to be surprisingly broader than previously imagined. According to the new-orientating, larger analysis: the world's oldest star-map seems to contain information of an actual celestial event of its time. This discovery uncovers the earliest exact scientific description of an otherwise rare, but not unknown, celestial phenomenon. The map's configurations, which have been considered as mythic representations, are now seen to be depictions of a rare gathering of planets in well-defined celestial positions. The information contained in the map refers to a specific point of time. The re-evaluation of this and of subsequent maps, together with the data contained therein, gives birth to new perspectives. By introducing these reference points of time - substantiated in astronomical terms - the appropriate chronology of the epoch in question, which has been much disputed, may now be dated with considerably greater precision than possible before. The well-known Egyptian star map in question was carried out by Senmut who was the vizier to Queen Hatshepsut and also the calendar registrar of Egypt during a very interesting period of the 18th dynasty (16th-15th century BCE). The recently decoded material can be objectively proven, based on modern astronomical calculations, to depict important astronomical circumstances. It has now become clear that the map of Senmut neither depicts an arbitrary gathering of planets in the sky nor is it a virtual copy of possible older patterns made by Senmut's predecessors. Since this stellar map describes a planetary conjunction (i.e. a close encounter of the planets) in which a unique pattern of the positions of the planets concentrated within a defined sector of the sky, it therefore contains information unmistakably related to a fixed point of time. It has been possible to calculate this as May 1534 BC, (ed. : any doubts about the accuracy of the calculations? - please, study FAQ: Dating the Oldest Egyptian Star Map ). According to the analysis, this dating may additionally be supported by the map's record of a simultaneous solar eclipse. The map seems to have been made later than the events in question, and although the eclipse was possibly not observed directly, it had been relatively easy to re-calculate and put on the map. Likewise, most of the planets are recorded without they could be seen in the sky due to their placements near to the sun. The presented interpretation seems being confirmed with great precision by modern astronomical methods. Accordingly, Senmut's star map must be acknowledged as one of history's oldest concretely recorded scientific achievements. Subsequently produced star-maps in Egypt seem to confirm this discovery. Created under the reigns of different pharaohs during 400 years or more after the first map, these maps exhibit Senmut's principle of depicting a certain kind of a planetary conjunction in the certain celestial sector. These findings seem to be in accordance with a now forgotten tradition by which these younger star-maps were produced only at the time of those pharaohs, such as Ramses II, where the actual conjunctions of the relevant type appeared in the Egyptian sky. Many scientific disciplines have been involved in Ove von Spaeth's project: especially including astronomy and Egyptology - and with valuable correcting data contributed by Dr.Scient. Kristian Peder Moesgaard, Director of the Steno Museum (Denmark's National Museum for the History of Science) and Egyptologist Dr.phil.h.c. Erik Iversen, formerly Associate Professor at the University of Copenhagen. The "Centaurus International Magazine of the History of Mathematics, Science and Technology" is edited and issued by the History of Science Department, Aarhus University, Denmark (and published by Blackwell-Munksgaard). The result and the perspectives of Ove von Spaeth's decoding of the Senmut map have been shown a great interest and have been recorded, evaluated, acknowledged as well as disputed or protested. Some of the responses are listed below. The answers to most of the many questions and reactions are presented in detail in the FAQ-list on next web page. - that the treatise on the dating contained in the Senmut star map never states that the mentioned solar eclipse had been observed in Egypt. The recording on the map only shows that the calculated eclipse has in fact taken place. - the paper does not mention anything about a total eclipse; and it is a fact that also annular eclipses were recorded by the ancients. - moreover, it is never stated that the row of planets could be seen at the same time as the eclipse - in fact, besides the differences of day and night observations, the map might show that some days had past after the eclipse. - it is hardly possible on a pc or laptop to obtain a result with the necessary precision by using normal computer star programs. These can never match the huge computer astronomy programs (important extra details) at the scientific institutions. All this is being taken care of in the treatise and carefully emphasized in the text. However, many people have exposed not being able to read the few pages, or even take a look before forming their opinion of a text they have never read. "... I have read with interest information provided on your website concerning the research of the Senmut star-map and its probable relation to Moses. You suggest the map describes a real astronomical observation ........ As I am writing a book on the chronology of Jesus Christ, my interest was drawn to what seems a conjunction of Saturn and Jupiter in the very year that an eclipse of the sun occurred over Egypt. - (My research shows two possible dates for the [such kind of] solar eclipse, one retro-calculation with "Voyager" software came up with June 1, 1478 BC; the other, Julian date August 23, 1463BC) ...". "... When considering the existence of an original star chart that indicates the occurrence of a solar eclipse 3500 years ago, one should be allowed to focus one's attention on the closest - chronologically and geographically - solar eclipse that actually occurred. Why else would the indication of a solar eclipse be inserted into a star chart? The thesis on Senmut's star chart has raised an interesting discussion. - Ove von Spaeth, you have engendered quite a row among astronomers. If nothing else, your work will lead to some interesting clarifications - which is more than most books have managed to achieve. ..."
"... A closely-reasoned scientific article that explores the implications and significance of an unusual configuration of planets and stars represented on an ancient Egyptian star map - the Senmut Star Map. His approach - a combination of modern astronomical and mathematical evidence with archaeological materials and Egyptology - allows for a fuller understanding of the development of astronomy in ancient Egypt and to provide important chronological evidence. Ove von Spaeth's article takes a thoughtful and reflective leap in this direction and brings startling new light upon the skies of the Senmut star map. ..."
"I found Ove von Spaeth's page on Senmut's Star Map very interesting. - It's also interesting that von Spaeth suggested that the map indicated a "specific point in time"; on that I agree because it's something the Ancients would do. Why in this living world, on the other hand, von Spaeth would include a series of responses on the subject from the-hall-of-maat (net discussiongroup) - I cannot imagine. I also loved the choice comment by Owen Gingerich: Quote: "... the [von Spaeth's] findings are very ingenious and admirable, ..." "
- Sebastian Richter, Dr., Ägyptologisches Institut, Universität Leipzig (21.Sep.00 & 17.Oct.00); - Lisa Montago Leahy, Ed., The Journal of Egyptian Archaeology, Department of Ancient History and Archaeology, The University of Birmingham (20.Sep.00); - Rolf Krauss, Dr., Ägyptisches Museum und Papyrussammlung, Berlin (5.Oct.99); - Amanda McCaig, Ed., Astronomy & Geophysics, The Journal of the Royal Astronomical Society, University of Leeds (9.Sep.00); - Mike Levad, Developer, The Franklin Institute Science Museum, Philadelphia (7.May.02); - Dave Eicher, Astronomer, Ed. : Astronomy Magazine, Wausheska, Wisconsin (24.Feb.2003); - Margaret Rossiter, History of Science Educator, Ed. : Isis Journal of the History of Science Society, Cornell University, NY (5.May.02); - etc. - Tanks to all for their interest. :: Comments. - Debate and criticism are indispensable to science and research. Acknowledgements and critic from esteemed scientists, scholars, and other experts and authorities have been productive in the actual case, indeed. However, the invaluable asset of criticism can be misdirected by incorrect quotations from the paper under discussion, and even by "references" to strange statements, which the treatise never has contained. But once entered into the debate, such tend to remain in circulation. Some of the skeptics (all not quoted above) wish to present a somewhat different result (concerning a solar eclipse) based on their calculations from certain formulae - e.g. in "The Nautical Almanac", or PC astronomy-programmes - but without knowing the existence of alternative formulae: differences of these formulae are due to hitherto unsolved problems concerning the Delta-T factors. Besides, the opponents inexpediently disregard the fact that in the treatise the in reality interesting conditions of a solar eclipse (or the eclipse itself) are not at all treated as a factor as regards the basic dating of this star map. 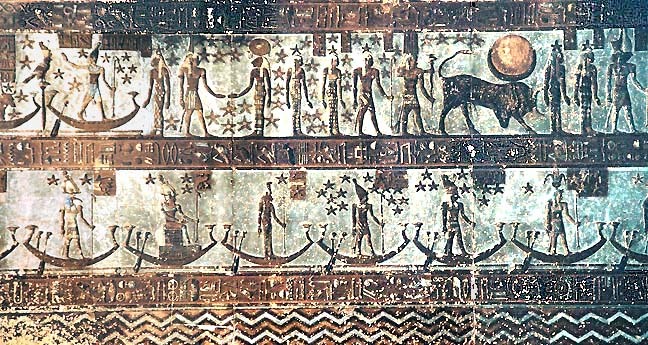 Among the critics, some are concerned with alleged Egyptological problems which in fact are non-existent - and they ignore that the treatise's star map elements contain identifications which previously have been recognized, especially in Neugebauer & Parker's authoritative work "Egyptian Astronomical Texts, I-III". A problem appears to occur because some of the critics openly substitute their own opinions and considerations for concrete facts and data. - Furthermore, they forget that the treatise on Senmut's Star Map is published in the esteemed "Centaurus International Magazine of the History of Mathematics, Science, and Technology". Prior to publication in this journal, as required, the treatise has been peer-reviewed by experts. - The same rules and principles apply to "Aristoriton Journal of History, Archaeology and ArtHistory", which published parts of the treatise. Here too, peer-review is performed by specialists in the relevant fields and/or topics, and further, is read one more time by the Editorial Board. In addition, authorities on the history of astronomy and Egyptology: - Professor Owen Gingerich, Harvard-Smithsonian Institute (11.Oct.2001), - Sir Patrick Moore, D.Sc., Astronomer, BBC Science editor (15.Sep.2000), - and Professor Dr. Erik Hornung, Basel Universitaet (24.Oct.2001), - all with a special knowledge and long-term interest concerning the Senmut star map - have acknowledged, independently and voluntarily, the star map dating project and the value of what it suggests. They, and the many others, welcome the work as a promising proposal for a solution and do not speak about any "truth" about something having taking place 3500 years ago - whereas the opponents are expressing their own critic ("this is completely impossible" ... etc.) as being the very truth and with no doubts. And note that no skeptics have proven any calculation wrong concerning the treatise's general positions in the sky for the Sun, Moon, and the planets - these are all correct and unambiguous. 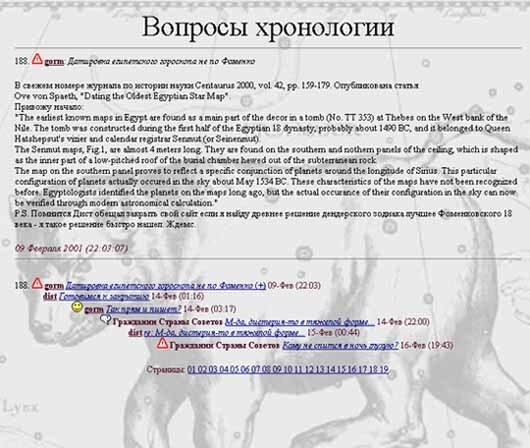 In any case, comprehensive answers are presented by our web site page: FAQ: Dating the Oldest Egyptian Star Map (cf. paragraphs 3 and 5) - and in addition some special comments below. From the libraries' article-bases, copies (xerox, etc.) of the treatise can be requested from the issue of Centaurus with the reference No. ISSN 0008-8994 : "Centaurus International Magazine of the History of Mathematics, Science, and Technology", Vol. 42;3, 2000, pp 159-179. - Or the treatise may be downloaded at the web page: "The Senmut Star Map Decoded" . Typically three kinds of problems come up by many of the critics who prefer to think that no other valuable system, formula, or tradition in this relation exists than the only one which the critics themselves first had happen to be acquainted with long ago. - A discussion group being housed by well-respected Graham Hancock web site, was introduced to R. Avry Wilson's considerations (20.Dec.2003) concerning the Senmut map. Wilson has computed the data from OvS' treatise and obtained some strange results - because he used his Starry Night Pro Software. Wilson seems to observe the belief that this is far better than using e.g. the big scale computers on those universities where scientists in several cases have spoken in favour of the treatise. Thus, in the case of the planet's sky positions 3,500 years ago, his experiment was bound to go wrong - and, consequently, was impossible to build a hypothesis on, but he did it anyway. Unfortunately, he uncritically considered new literature in this field automatically to be the best and previous literature to be outdated, which is absolutely not the case when dealing with fundamental planetary formula theory. It is true that the Delta-T problem is not solved - but this is exactly the case in his Starry Night Pro Software! Wilson should have started, instead, with studying planetary computing problems (obtaining a high precision here is extremely more complicated than in case of the stars), cf. paragraphs 1-4 in FAQ: Dating the Oldest Egyptian Star Map . - When future computer power and computations will continue to improve, they will not move the basic results of the treatise, they can only strengthen them. - A somewhat strange criticism (Gusjev, 2.Oct.2002, part not quoted) cites the impossibility of a "total solar eclipse", in spite of the fact that the treatise does not mention a total eclipse. As stated elsewhere several times in the texts of Ove von Spaeth, this eclipse means nothing for the exactness of the dating, and is of no significance for the basic dating of this star map. In the paper it was only natural to present a suggestion for dating the eclipse, and it was based on calculation by the best astronomical programmes. In any case, the general positions in the sky for the Sun, Moon, and all the planets are correct and unambiguous. 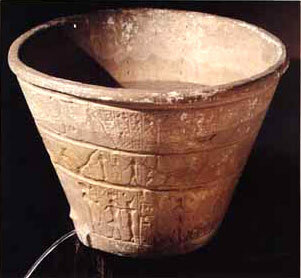 The ancient Egyptians were able to calculate several astronomical events. The paper presents that the Senmut star map indicates a solar eclipse at a distance of approx. 10 degrees of arc from the Sirius-star meridian. In several respects it is a most interesting fact, though almost nobody seem to care about this and its perspectives but instead about an alleged, possibly more late eclipse to be seen elsewhere after being computed by - in this context - apparently less effective programmes. Please note that neither the map nor the paper say anything about annular or total eclipse, and they say nothing about that it is proved it was observed. No more, no less. - On the aforementioned FAQ-page: the Paragraphs 7, 8, and 9 covers the questions concerning Christian Leitz (July 2002). Christian Leitz has earlier tried, in vain, to solve the enigma of the Senmut Star Map (just like Joachim Friedrich Quack, 2.Oct.2001, cf. above - in his way - also have tried). Unfortunately, Leitz' disagreeing article abandons sound scholarship and methodology concerning his total disregard of the important material of the astronomical clues in Ove von Spaeth's treatise. Their problem emerge because of the way of Senmut's handling the elements in the structure of his star map. Senmut did so in several cases - e.g. concerning Mars and also the eclipse - by maintaining the tradition and at the same time expanding its ability of expression: A quite normal feature, as the Egyptians practised extended play on words (more than in any other known culture) and multiple meanings of hieroglyphic texts, and in this field Senmut is famous as the great master. When Leitz tries to argue that some of the paper's points are against tradition, it is a circularity of no meaning, because it is exactly what the paper itself suggests but on grounds of the rationale behind Senmut's inventive construction of his star map and the fact that Senmut was a pioneer extending and renewing tradition. Leitz' claim about missing the planet Mars as depicted as a falcon is unrealistic, because the falcon issue was in use some hundred years later than Senmut - as Leitz very well should know. Indeed, it has no foundation when Leitz is using the lack of a Mars-falcon in the Senmut Map to support his total rejection of Mars being present there. To form an opinion on facts presented may take some more insight and experience of historical astronomy than being mobilized in his article. Thus, it should be respected that astronomy basically is an exact science which often may have less in common with the Humanities' manner of interpretations: Leitz ignores completely that the treatise's exact statistics of 2000 years of the planetary conjunctions fit precisely and unambiguously to the Senmut map and to some equal maps as well (the exact facts and data are presented in the treatise's Paragraph 6 and Table 1 and 2). Furthermore, Leitz treats one of the common provisional models of the chronology as if it were a historical "truth". The real truth is that a consensus (Leitz, page 140, expression: "... generally accepted") can never constitute any proof of scientific validity. Leitz states that "... all the calculations of von Spaeth are based on a wrong assumption (presence of Mars in a retrograde movement)." False !, the treatise's main argument is the importance of the very conjunction of planets - exactly depicted without Mars - around the Sirius meridian as shown openly and directly on the map. Regarded from any experienced astronomer's point of view it is the very logical solution which, by the way, nobody had ever suggested before Ove von Spaeth's treatise. In his article Leitz has not yet proven anything at all. And the unacceptable number of unfounded statements weakens the article. And its conclusive remarks exclude, in reality, all Egyptologists who do not happen to agree with Leitz' opinion - and among these one of the world's finest experts (appreciated in OvS's treatise for his counsel and support). Demonstrating, too, the impossible problem of trying to contradict the treatise when the reading of it thus has shown to be somewhat sporadic. - The eclipse question is being answered several times, but astronomer Stephen Tonkin also writes (04:34am) that "... it does not explain, why the position of Saturn (perhaps the easiest planet to calculate) is so wrong ...". But he (07:07am) appreciates Owen Gingerich as the great authority, which has endorsed Ove von Spaeth's treatise. And in the treatise in question there are - besides results of astronomical calculations supported by modern computer power - also reference to results of Owen Gingerich & William Stahlman: "Solary and Planetary Longitudes for the Years -2500 to +2000 by 10-Day Intervals" (Madison 1963). It is a fact that the 1963-conditions (for the book) were more advanced than normally thought of today, i.e. the calculations were made by the most expanded, advanced, and detailed planet programmes executed by enormous computers as of the great research centres and universities - being far better than the present "dinky" star programmes in more "normal" computers (as being used by Stephen Tonkin and colleagues). Thus, concerning the alleged problem with Saturn, Stephen Tonkin has not discovered that Gingerich/Stahlman's book/table shows exactly the same result as being stated in the treatise. Hasty decisions as to declare that the position of Saturn is wrong, and by only base this on that the treatise's calculations showing otherwise than one's own calculations do, is - with all respect - a practice of non-valid scientifically conduct and, more so, it is absurd to publish before thoroughly reconsidering. The same goes for the statement about certain ancient observation methods as being merely myths. (Cf. when astronomer Gerald Hawkins and mathematician engineer Alexander Thom (after investigating some 300 sites) proved the today accepted fact, that it was not myths that Stonehenge and many other prehistoric megalithic circles, alignments, and isolated standing stones were ingeniously constructed astronomical markers and calculators, - many archaeologists and historians became furious). Once more it must be emphasized, that by dealing with such delicate problems and going 3,500 years back in time: don't use "normal" star programmes, even those of good quality and reputation, but only use the most detailed special programmes (which, unfortunately, are not distributed for sale normally). - Two of the contributions above - from Joanne Conman and van Gent (both: 21.Jan.2002) - from an international Newsgroup for the History of Astronomy are joining the discussions on the internet among researchers, scholars, and scientists concerning Ove von Spaeth's scientific treatise on dating the world's oldest star map. About 25 different letters relating this matter were distributed world-wide to all members of the group during the first months of 2002. Unfortunately, solely based on accounts and comments the two contributors' remarks also contain serious misunderstandings. They have stated their mere opinions, all right. They 'think', and 'suppose', and 'assume', and using hearsay - but present no concrete facts and data. Besides from appearing not to be too well informed or experienced on the special points in this special case, they pronounce their verdict in absentia having never proven nor documented any error in the paper in question - and yet their newsgroup-talk later has been incompetently referred to as if the opinions here were a real "source". In their own letters Conman & van Gent admit neglecting to consult the primary source, i.e. they had never read the original text/treatise. (For instance, it is presented here: The Senmut Star Map Decoded ). Apart from the analysis: a Moses relation possible? The actual analysis of the Senmut star map follows its own objective purpose: to be concerned with only the dating of the ancient Egyptian star map and without any dependence of whatever the result could be used for in other connections. However, Ove von Spaeth's treatise, published in "Centaurus" (42;3, 2000), with scientific documentation for the dating of Egypt's oldest star map, has been re-edited to be used by non-astronomers. The said version was later published also in the appendix in Volume 2 of Ove von Spaeth's book-series ("Assassinating Moses", vols. 1-5) about the historical Moses. Unusual many and very strong indications suggest that the Senmut star map is being of a special contemporarity with Moses and his era; cf. Debate on Vol. 2 , and Vol. 2 Inform , and not least "On History". Ptolemaic era (ca. 305--30 BC).